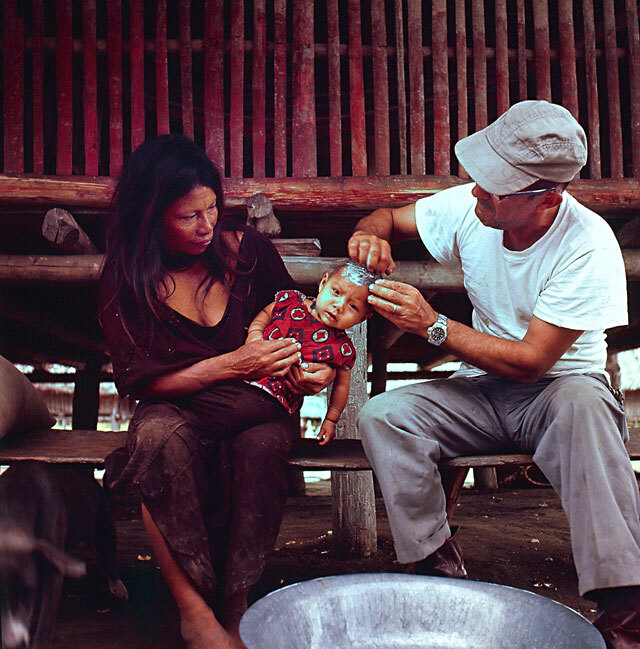 Picture of SIL (Summer Institute of Linguistics) missionary pilot Ted Long treating an indigenous baby for "cradle cap." Cradle cap is a seborrheic dermatitis that commonly affects infants in their first three months of life. During initial stages of contact with previously uncontacted tribes, missionaries most commonly devote almost all of their time to giving medical aid rather than teaching about the bible. This situation of missionaries being called upon to give medical aid is typical and an identical situation occurred when Harriet Fields and Hattie Kneeland first made contact with the Matsés tribe. This photograph illustrates the great trust that the Ashaninkas had in SIL missionaries, trusting them with the future of their tribe (their children). Trust like this is not given lightly, and the SIL missionaries had to earn that trust. The good deeds and sacrifices of American missionaries like Ted Long, Harriet Fields and Hattie Kneeland should not be forgotten.